Happy Mother's Day to all the wonderful Mom's out there! It's called a Cascading fold card. It may seem a little complicated to figure out at first but once you have the measurements it comes together really quickly and becomes addictive simply because the possibilites for finishing a card like this are limitless! 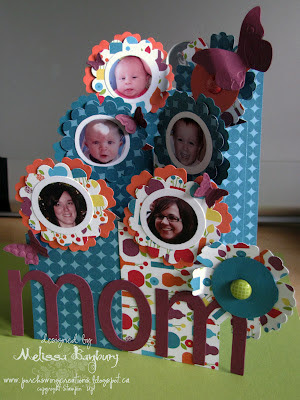 I did quite a bit of searching to find a template for a card like this that was straight forward and easy to follow. It came as no suprise that it was another Stampin' Up! Demonstrator that had the best tutorial!! Jan Farring posted a step by step guide found HERE with some great examples. I made the flowers that the pictures are adhered to by punching out 3 modern labels and criss crossing them, then adding a punched 1 1/4" circle in the center. I printed all the photos in My Digital Studio. Hope you all had a wonderful Mother's Day weekend! Thanks so much for looking! What a clever way to use this card fold!